Eclogite is an important high-pressure metamorphic rock and mainly forms from basalt or gabbro in the subducting slab. Eclogite is mainly composed of garnet and omphacite and plays a key role in mantle convection due to its relatively high density. In addition, the occurrences of eclogitic xenoliths in kimberlites and solid inclusions in diamonds indicate the presence of eclogite in the mantle. Eclogite may explain positive density anomalies in the upper mantle. Therefore, understanding the thermoelastic properties of eclogitic garnet and omphacite is important to model the structure and fate of the subducted slab in the upper mantle. 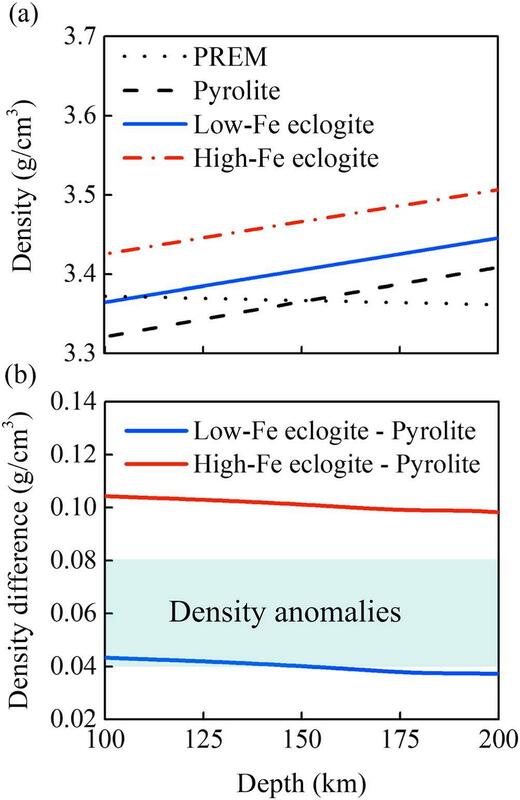 However, the lack of thermoelastic parameters of eclogitic garnets and omphacites hampers accurate modeling of eclogite density at deep-Earth pressure-temperature conditions. Dr. XU Jingui (First Author) and Associate Prof. FAN Dawei (Corresponding author) from Prof. ZHOU Wenge's group at the Institute of Geochemistry, Chinese Academy of Sciences (IGCAS), in collaboration with Prof. Przemyslaw Dera and Dr. ZHANG Dongzhou from the Hawaii Institute of Geophysics and Planetology, University of Hawai'i at Mānoa, USA and Dr. SHI　Feng　from the State Key Laboratory of Geological Processes and Mineral Resources, China University of Geoscience, China, explored the synchrotron-based high-pressure and high-temperature single-crystal X-ray diffraction experiments on eclogitic garnets and omphacites using an externally heated diamond anvil cell. The scientists obtained the thermoelastic parameters of natural eclogitic garnets and omphacites. The results indicate that the eclogitic garnets have smaller K0 (isothermal bulk modulus) values than end-member garnets, which may result from the excess volume induced by the incorporation of grossular. Unlike the pyrope-almandine solid solution, which has K0 values increase with increasing almandine content, the compositional dependence of K0 values for pyrope-almandine-grossular garnets is complicated. For pyrope-almandine-grossular garnets solutions, increasing almandine content may lower the thermal expansion. The K0 values of omphacite generally increase with increasing jadeite content. On the contrary, increasing aegirine content may enhance the thermal expansion. 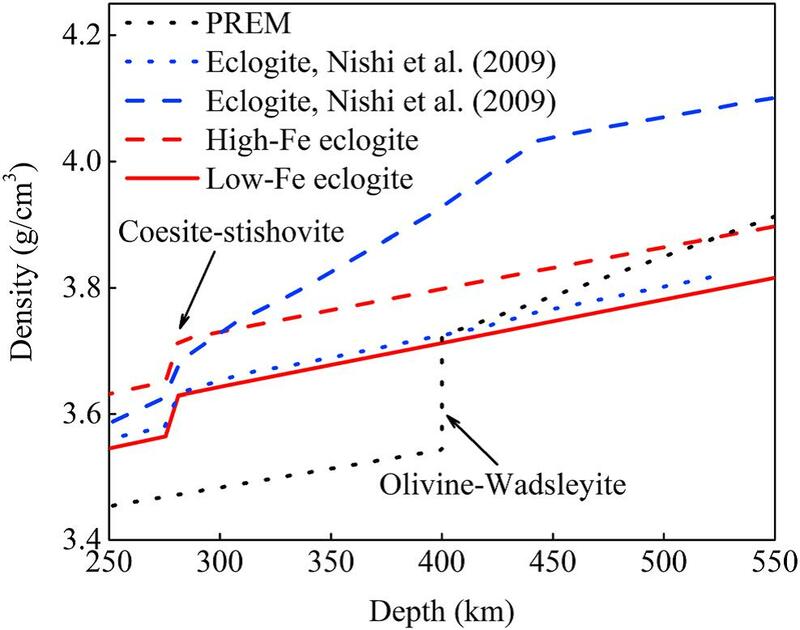 In addition, the thermoelastic parameters were used to model the densities of high-Fe and low-Fe eclogites in the subducted oceanic crust and the normal upper mantle. The modeling results indicated that eclogite would contribute to the driving force for the slab subduction to the transition zone. However, the presence of metastable low-Fe eclogite may contribute to the slab stagnation within the upper range of the transition zone. Additionally, eclogites can explain the density anomalies at depths of 100-200 km in the upper mantle of Asia. This study was supported by the National Natural Science Foundation of China, the Joint Research Fund in Huge Scientific Equipment under cooperative agreement between NSFC and CAS, the Chinese Academy of Sciences “Light of West China” Program, the Strategic Priority Research Program (B) of the Chinese Academy of Sciences, the China Postdoctoral Science Foundation, the Youth Innovation Promotion Association CAS, and the CPSF-CAS Joint Foundation for Excellent Postdoctoral Fellows. The work titled “Thermoelastic Properties of Eclogitic Garnets and Omphacites: Implications for Deep Subduction of Oceanic Crust and Density Anomalies in the Upper Mantle” was published in Geophysical Research Letters (2019) 46, 179-188.